Falcon is currently distributed under a dual licensing GPL/FPLL scheme. The GPL licensing scheme is provided to ensure compatibilty with Open Source and Free Software products. It's a relative strict license which is not particularly adequate for virtual machine based scripting languge interpreters and engines, but it can be chosen to develop pure GPL applications or to favor integration with already existing GPL embedding applications. The Falcon Programming Language License is specifically designed around the concept of an open source scripting language engine. It grants usability of the covered source in commercial applications, as it supports applying different and incompatible licenses to embedding and extension elements, while ensuring the openness of the core engine and of any work derived directly from it. Falcon version 0.8.10 and higher are released under one of GPLv2 or FPLLv1.1, at your choice. 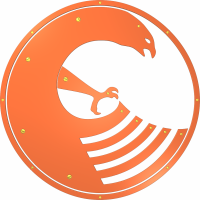 All the logos and images contained in this site and related to Falcon, including the "Round Falcon Logo" below here are licensed as Creative Commons "Attribution Non-Commercial Share Alike". CC Attribution Non-Commercial Share Alike legal code. Here we have a pair of "powered by Falcon" buttons that you may stick on your site or include in your documentation to help out our project.